Wow! 4 hours of majestic beauty! Two suns that collided hundreds of years ago are going to create a new star that will be visible in the sky for about six months in the year 2022. Supposedly it will be the brightest star in the sky during that time. Oh, thank goodness! 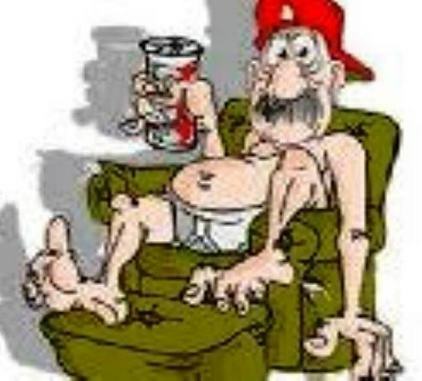 I was beginning to think this mess we are in was real! Turns out, we're just a HOLOGRAM! Theoretical physicists and astrophysicists, investigating irregularities in the cosmic microwave background (the 'afterglow' of the Big Bang), have found there is substantial evidence supporting a holographic explanation of the universe -- in fact, as much as there is for the traditional explanation of these irregularities using the theory of cosmic inflation. Although not an example with holographic properties, it could be thought of as rather like watching a 3D film in a cinema. We see the pictures as having height, width and crucially, depth -- when in fact it all originates from a flat 2D screen. The difference, in our 3D universe, is that we can touch objects and the 'projection' is 'real' from our perspective. In recent decades, advances in telescopes and sensing equipment have allowed scientists to detect a vast amount of data hidden in the 'white noise' or microwaves (partly responsible for the random black and white dots you see on an un-tuned TV) left over from the moment the universe was created. Using this information, the team were able to make complex comparisons between networks of features in the data and quantum field theory. They found that some of the simplest quantum field theories could explain nearly all cosmological observations of the early universe. In a new deep-space photo of two starry nebulas, a cat's paw reaches out to high-five a glowing, red lobster. 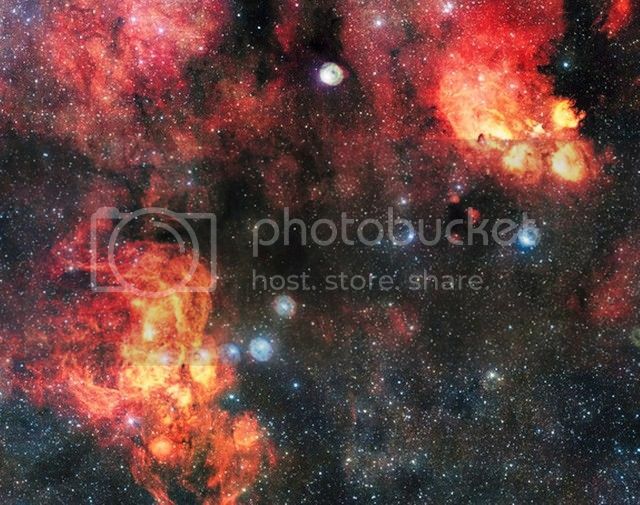 This image from the VLT Survey Telescope shows the Cat's Paw Nebula (right) and the Lobster Nebula (left), two clouds of cosmic dust and gas with active star formation. Hot, young stars cause the surrounding hydrogen gas to glow red. With around 2 billion pixels, this is one of the largest images ever released by ESO. How can we comprehend the distances to the stars? 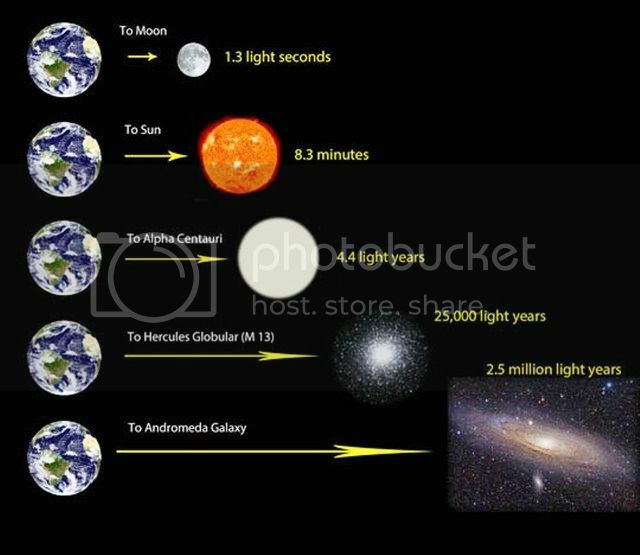 This post explains light-years in terms of a scale of miles and kilometers. Stars other than our sun are so far distant that astronomers speak of their distances not in terms of kilometers or miles – but in light-years. Light is the fastest-moving stuff in the universe. If we simply express light-years as miles and kilometers, we end up with impossibly huge numbers. But the 20th century astronomer Robert Burnham Jr. – author of Burnham’s Celestial Handbook – devised an ingenious way to portray the distance of one light-year and ultimately of expressing the distance scale of the universe, in understandable terms. He did this by relating the light-year to the Astronomical Unit – the Earth-sun distance. One Astronomical Unit, or AU, equals about 93 million miles (150 million km). Another way of looking at it: the Astronomical Unit is a bit more than 8 light-minutes in distance. Robert Burnham noticed that, quite by coincidence, the number of astronomical units in one light-year and the number of inches in one mile are virtually the same. 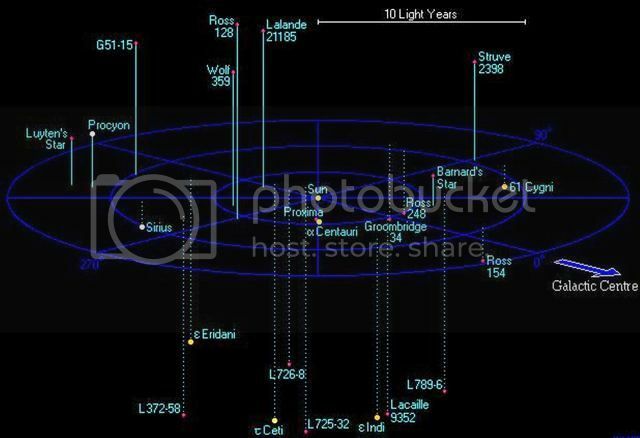 For general reference, there are 63,000 astronomical units in one light-year, and 63,000 inches (160,000 cm) in one mile (1.6 km). This wonderful coincidence enables us to bring the light-year down to Earth. If we scale the astronomical unit – the Earth-sun distance – at one inch, then the light-year on this scale represents one mile (1.6 km). The closest star to Earth, other than the sun, is Alpha Centauri at some 4.4 light-years away. Scaling the Earth-sun distance at one inch places this star at 4.4 miles (7 km) distant. Sombrero galaxy (M104): 65,000,000 miles, remember, if the AU is 1 inch! Our Local Community in one small part of the Milky Way Galaxy: There are 33 stars within 12.5 light years of our sun. 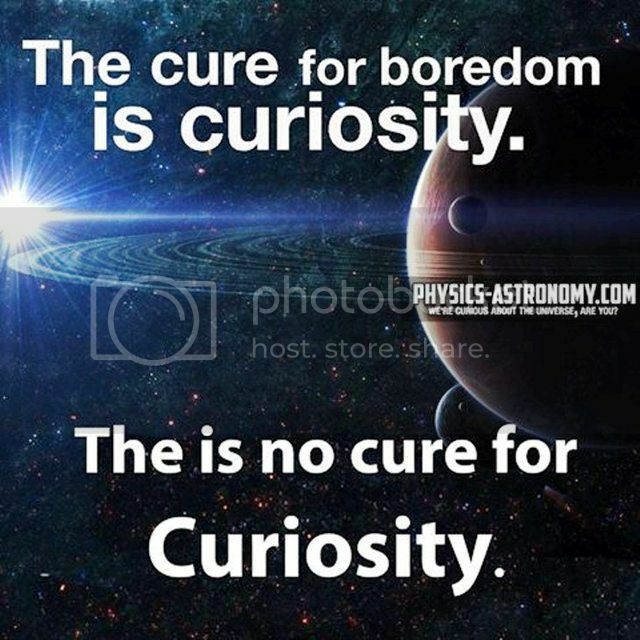 Image via Atlas of the Universe. Light is the fastest-moving stuff in the universe. It travels at an incredible 186,000 miles (300,000 km) per second. That’s very fast. If you could travel at the speed of light, you would be able to circle the Earth’s equator about 7.5 times in just one second! A light-second is the distance light travels in one second, or 7.5 times the distance around Earth’s equator. A light-year is the distance light travels in one year. How far is that? Multiply the number of seconds in one year by the number of miles or kilometers that light travels in one second, and there you have it: one light-year. It’s about 5.88 trillion miles (9.5 trillion km). The Universe we can see: This scale starts close to home but takes us all the way out to the Andromeda Galaxy, the most distant object most people can see with the unaided eye. Image via Bob King / Skyandtelescope.com. Bottom line: Light is fast; the universe is large. Number of raindrops in a rain storm? Obviously the author has never been to Florida! The tricky thing about statistics, however, is that they rarely stay put. From one moment to the next, populations grow and shrink, empires rise and fall, and even stars wink in and out of existence. 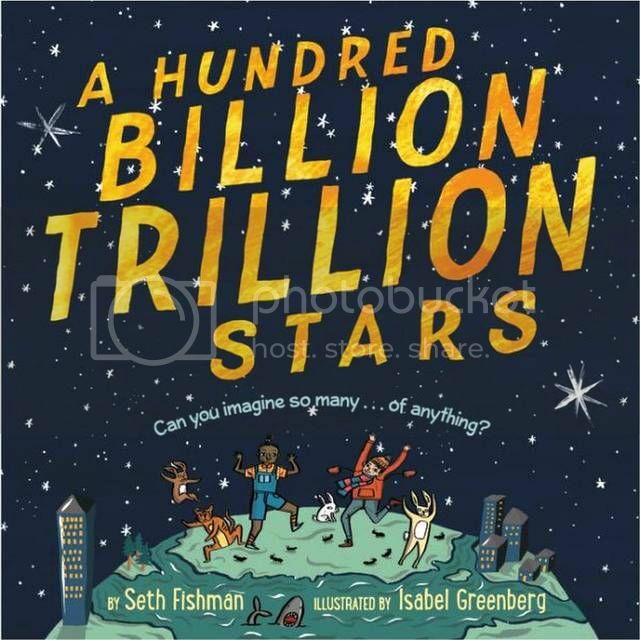 Such was the challenge Fishman faced while he compiled his list of scale-busting numbers, from the number of trees pumping out the oxygen we breathe (3,000,000,000,000) to the weight of the Earth itself (13,000,000,000,000,000,000,000,000 lbs.). Like a bit of froth on the crest of an ocean wave, our observable universe may be nothing more than a sliver sitting within the edge of a bubble that's constantly expanding into a higher dimension. While this mind-boggling idea might sound like something out of a physicist's fever dream, it is in fact a new endeavor to reconcile the mathematics of string theory with the reality of dark energy, a mysterious, all-pervading cosmic force that acts in opposition to gravity. String theory is an attempt to unite the two pillars of 20th century physics — quantum mechanics and gravity — by positing that all particles are one-dimensional strings whose vibrations determine properties such as mass and charge. The theory has been described as mathematically beautiful, and for a long time has been one of the leading contenders for what scientists call a Theory of Everything, meaning a framework to explain all physics, popularized in books like bob Greene's The Elegant Universe (Norton, 1999). In the early 2000s, researchers realized that string theory allowed for as many as 10^500 (that's the number 1 followed by 500 zeroes) unique universes to exist, creating a multiverse landscape in which our particular universe was just a tiny subsection, as Live Science previously reported. But string theory equations also mostly produced hypothetical universes lacking in dark energy, which astronomers discovered in the 1990s and which is currently accelerating the expansion of the cosmos. Earlier this year, researchers dealt a blow to string theory by suggesting that not a single one of the nearly countless universes it describes actually contains dark energy as we know it . "It is increasingly clear that the models proposed so far in string theory to describe dark energy suffers from mathematical problems," Ulf Danielsson, co-author of a new paper published Dec. 27 in the journal Physical Review Letters and a theoretical physicist at Uppsala University in Sweden, told Live Science. The basic problem, Danielsson said, is that the equations governing string theory say that any universe with our version of dark energy in it should quickly decay away and vanish. "Our idea is to turn this problem into a virtue," he said. Along with his colleagues, he constructed a model in which the process causing these dark-energy-permeated universes to decay actually drives the inflation of bubbles made from many dimensions. We live within the boundary of one of these expanding bubbles and "dark energy is … induced in a subtle way through the interplay between the bubble walls on which we are living and the higher dimensions," Danielsson wrote in a blog post describing the new theory. But other researchers aren't buying it. "This is a math-fiction that has zero experimental evidence speaking for it," Sabine Hossenfelder, a physicist at the Frankfurt Institute for Advanced Studies in Germany, told Live Science. Hossenfelder has been critical of much of the latest pontificating in fundamental physics, and published a book last year called Lost in Math: How Beauty Leads Physics Astray (Basic Books, 2018). "String theorists propose a seemingly endless amount of mathematical constructions that have no known relationship to observation," she said. But Danielsson does not think that string theory will be forever untestable, and that the current debates surrounding it are already providing some checks on the theory. "If it turns out that string theory cannot yield dark energy of the kind we observe, then string theory is not only tested, it is proven wrong," he said. Like a mountain looming over a calm lake, it seems the universe may once have had a perfect mirror image. That's the conclusion a team of Canadian scientists reached after extrapolating the laws of the universe both before and after the Big Bang. Physicists have a pretty good idea of the structure of the universe just a couple of seconds after the Big Bang, moving forward to today. In many ways, fundamental physics then worked as it does today. But experts have argued for decades about what happened in that first moment — when the tiny, infinitely dense speck of matter first expanded outward — often presuming that basic physics were somehow altered. Researchers Latham Boyle, Kieran Finn and Neil Turok at the Perimeter Institute for Theoretical Physics in Waterloo, Ontario, have turned this idea on its head by assuming the universe has always been fundamentally symmetrical and simple, then mathematically extrapolating into that first moment after the Big Bang. That led them to propose a previous universe that was a mirror image of our current one, except with everything reversed. Time went backward and particles were antiparticles. It's not the first time physicists have envisioned another universe before the Big Bang, but those were always seen as separate universes much like our own. 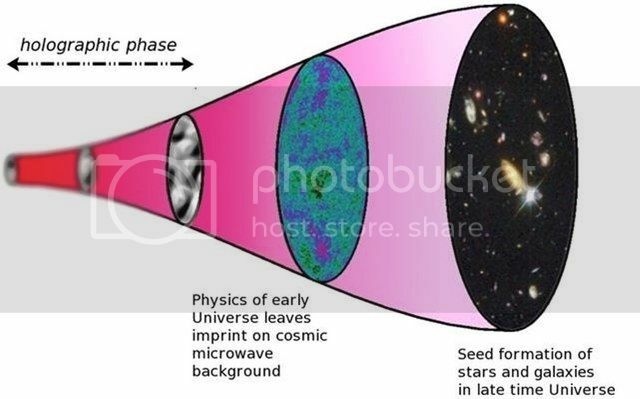 "Instead of saying there was a different universe before the bang," Turok told Live Science, "we're saying that the universe before the bang is actually, in some sense, an image of the universe after the bang." "It's like our universe today were reflected through the Big Bang. The period before the universe was really the reflection through the bang,” Boyle said. Imagine cracking an egg in this anti-universe. First, it would be made entirely of negatively charged antiprotons and positively charged anti-electrons. Secondly, from our perspective in time, it would seem to go from a puddle of yolk to a cracked egg to an uncracked egg to inside the chicken. Similarly, the universe would go from exploding outward to a Big Bang singularity and then exploding into our universe. But seen another way, both universes were created at the Big Bang and exploded simultaneously backward and forward in time. This dichotomy allows for some creative explanations to problems that have stumped physicists for years. For one, it would make the first second of the universe fairly simple, removing the necessity for the bizarre multiverses and dimensions experts have used for three decades to explain some of the stickier aspects of quantum physics and the Standard Model, which describes the zoo of subatomic particles that make up our universe. "Theorists invented grand unified theories, which had hundreds of new particles, which have never been observed — supersymmetry, string theory with extra dimensions, multiverse theories. People just basically kept on going inventing stuff. No observational evidence has emerged for any of it," Turok said. Similarly, this theory would offer a much simpler explanation for dark matter, Boyle said. The scientists say this new theory grew out of a dissatisfaction with the bizarre add-ons proposed by physicists in recent years. Turok himself helped develop such explanations but felt a deep desire for a simpler explanation of the universe and the Big Bang. They also say this new theory has the benefit of being testable. Which will be crucial in winning over doubters. "If someone can find a simpler version of the history of the universe than the existing one, then that's a step forward. It doesn't mean it's right, but it means it's worth looking at," said Sean Carroll, a cosmologist at the California Institute of Technology who was cited in the paper but was not involved in the research. He pointed out that the current favorite candidate for dark matter — weakly interacting massive particles, or WIMPs — haven't been found and it might be time to consider other options, including possibly the right-handed neutrinos Boyle mentioned. But, he said, he's a long way from being persuaded and calls the paper "speculative." The Canadian team understands this and they will be using the model to propose measurable, testable elements to see if they are correct, they said. For instance, their model predicts the lightest neutrinos should actually be devoid of mass altogether. If they are right, it might reshape how we see the universe. "It's very dramatic. It completely runs counter to the way that physics has been going for the last 30 years, including by us," Turok said. "We really asked ourselves, could there not be something simpler going on?" How important are definitions when cataloging the universe? In early 2017, the two of us, along with a few others, refreshed the debate on the definition of planet in scientific nomenclature. The International Astronomical Union’s (IAU) historic definitional vote in 2006 recognized only eight solar system planets, and this has brought new focus to some underlying issues of importance to planetary science. Specifically, this debate touches on how words acquire their meaning and shape our thinking in both science and everyday life. Accordingly, the definition of planet is about much more than whether students learn Pluto’s name in a list of planets. In science, two languages describe the natural world: words (in our case, in English) and mathematics. Here, we’ll focus on words. Words possess power beyond communication: Word choice affects how we conceptualize, organize, synthesize, and contextualize information. Words are also how we scientists and educators communicate science to the public. In other words (so to speak), words structure our understanding of the world. This mental structure is what educational psychologists call a schema. Scientists define words as part of our scientific nomenclature with an eye toward schematic usefulness to conceptualize, organize, synthesize, and contextualize information about nature. Nomenclatures’ definitions arise organically: Scientists choose words and phrases to describe their work, and write them in peer-reviewed journals and periodicals, and speak them aloud in scientific conferences and classrooms. Precedent is a key element in forming definitions (just ask a lawyer!) that both reflect and promote a useful schema for understanding the natural world. That definitions arise through professional and common usage are one blow against the legitimacy of the IAU’s definitional vote. Another blow arises from the fact that scientists of one discipline should not presume to define words for another. An illustration stems from considering the word metal. Astronomers use it to describe elements in stars heavier than helium. Metallurgists use the word in the more common way, yet astronomers and metallurgists don’t fight over the definition — each user community knows what they mean when they use the word metal. What would happen if the metallurgical community declared an official definition of metal and then publicly scorned astronomers for using a different definition, saying, “I wish they would just get over it”? Just as different definitions of metal serve different communities, we, as planetary scientists, find it useful to define a planet as a substellar mass body that has never undergone nuclear fusion and has enough gravitation to be round due to hydrostatic equilibrium, regardless of its orbital parameters. This is the definition we presented at the 2017 Lunar and Planetary Science Conference. Indeed, planetary scientists already use and teach such a geophysical definition of planet to promote a useful mental schema about the round and non-round worlds we study: At least 119 peer-reviewed papers in professional, scientific journals implicitly use this definition when they refer to round worlds (including moons) as planets. The publication history for these papers spans decades, hailing from both before and after the 2006 IAU vote. This overwhelming precedent cements the geophysical definition’s legitimacy in professional planetary science. We realize that more than 100 objects in the solar system fit this geophysical planet definition, yet this does not dilute the word’s usefulness. Rather, subcategories of planets help us form a mental schema to recognize planets’ diversity and then draw conclusions and insights based on groupings of planets with similar properties. A few useful examples of diversity among planets include terrestrial planets (Mars), giant planets (Uranus), dwarf planets (Pluto, Eris, etc. ), and satellite planets (Europa). Each subcategory of planet helps us recognize similarities and differences: the domain of comparative planetology. For instance, Enceladus (an icy dwarf satellite planet) and Neptune (a giant planet) are very different types of planets in size, gravity, and orbits. Yet both are round, contain high amounts of water, and are located within our solar system’s Middle Zone. (This usage further illustrates the nonsensical claim by the IAU that dwarf planets are not planets; rather, dwarf planets are a subcategory of planets just as giant planets are.) Just as having approximately 400 billion objects that fit the definition of star in our Milky Way Galaxy does not diminish the usefulness of the word star, likewise having many planets in our solar system does not diminish the usefulness of the word planet. Similarly, stars’ size and spectral diversity between red dwarf stars and blue supergiant stars parallels planets’ diversity between small Kuiper Belt dwarf planets and giant planets. Definitions, like numerical measurements, have uncertainty, or as scientists like to call it, an “error bar.” Many small quasi-round worlds fall into that uncertainty on the small end of the size spectrum, and deuterium-fusing large worlds (brown dwarfs) fall into the error bars on the large end. However, the geophysical definition of planet has low enough uncertainty to still be useful to us. The geophysical definition further proves its worth when considering exoplanets orbiting other stars outside our solar system. As a thought experiment, assume our Milky Way Galaxy has a conservative 100 billion possible planetary systems anchored by at least one star. Assume a conservative 100 dwarf planets like Pluto or Eris in each system. That’s 10 trillion dwarf planets in just our galaxy. If one assumes five giant planets per planetary system, that’s only 500 billion giants in the galaxy compared to 10 trillion dwarfs. Thus, dwarfs outnumber giants 20 to 1 and are the rule rather than the exception. Re-formulating our schema of what a planet is facilitates such insights. This new schema for planet — properly defined by expert planetary scientists — will powerfully work itself out in grade school classrooms. Rather than teaching students the names of all the planets, teachers should emphasize the types and subtypes of planets and how the solar system is naturally organized outward from the Sun, using a handful of planets as examples. This is analogous to learning the organization of the periodic table of the elements without having to memorize all or even most of the 100+ names. Along with this teaching strategy, scientists, educators, and students should ignore illegitimate scientific definitions that arise via voting, such as the IAU’s planet definition. Instead, they should adopt definitions that arise naturally through usage by experts in the field, which reflect and promote a useful mental schema about the natural world and a more accurate picture of how science operates. Other scientists may find a different definition useful, such as one more concerned with orbits and gravitational effects on smaller worlds, as proposed by the IAU. However, such scientists should not look to the IAU’s vote to cement their preferred definition, but should rather use and teach the definition they find useful. In parallel, they should not begrudge other scientists’ criteria for what makes a definition useful to them. Just as in the example about the use of the term metal, each user community should use planet definitions useful to them without deferring to a central voting authority. 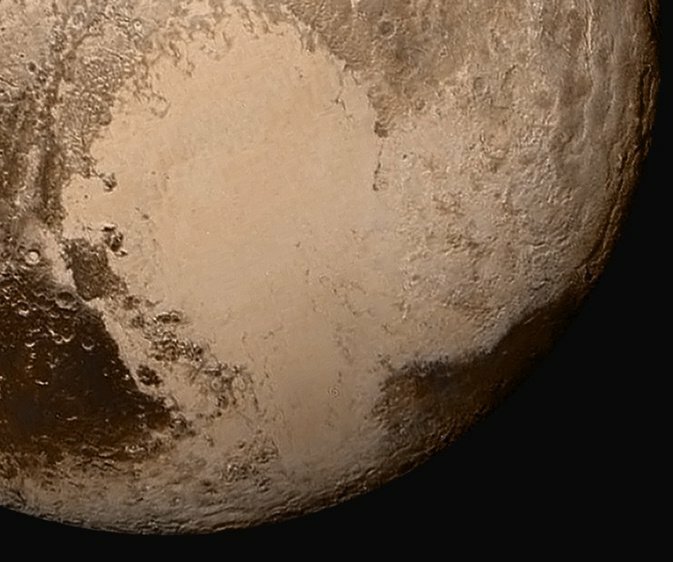 And, just as other definitions arise organically, the definition of planet may now be considered organic, drawing to a close this public hand-wringing debate and thawing hearts that had frozen toward the planet Pluto.